The New Zealand Team has secured three valuable medals during the final day of technical races at the International Surfing Association World Stand Up Paddle and Paddleboard Championships. The Kiwi performances throughout the day saw the team hold on to fifth place overall in the tightest of races to get on to the podium. Australian based Trevor Tunnington secured a bronze in the Men’s 5km Technical Race while Ollie Houghton (Auck) secured silver in the Under 18 Boys 5km Technical Race and Daniel Hart finished third in the Men’s 5km Prone Race. The Kiwi girls were also in action with Tara Hope finishing 13th in the Women’s 5km Technical Race, Maddie McAsey sixth in the Under 18 Girls 5km Technical Race and Devon Halligan sixth in the Women’s 5km Prone Technical Race. Tunnington noted the stacked field of athletes in the men’s race, guys that he competes against on the world circuit and ironically didn’t have high hopes of getting a podium finish. “I didn’t get a good start at all but managed to get some clean water and sprint my way up to the front pack. The entire race, it was the four of us at the front – Daniel (Hasulyo), Connor (Baxter), myself and Bruno (Hasulyo). It was a very tight race and a lot of fun” said Tunnington. “I think we were all stoked, at least I was, because we knew that most likely we would be getting at least a copper medal! That took the pressure off for the race and we were able to focus on setting a good pace and doing our best. I was really happy with my race and stoked to come third. It was awesome finishing with some close friends such as Daniel and Bruno and Connor” he added. Tunnington now turns his attention to the sprint race which starts on Friday and the distance race on Saturday which will complete the event. 18-year-old Ollie Houghton was in a race for gold, leading for much of the race before getting overtaken with the finish line in sight. “On the last buoy I was absolutely drained from dragging Ryan (Funk) round the last lap and he managed to sneak on the inside of me and around it and that was pretty much the difference between gold and silver” explained an exhausted Houghton. “Although gold would have been so much better I’m still stoked with a top three performance” added Houghton who went on to compete in the Men’s Race but admitted to fatiguing a lot quicker in the second half of the race. Houghton also turns his focus to the distance race which is being held at Shenzhou Peninsula on December 1. The New Zealand Team comprises eleven athletes and they are looking to defend their bronze medal they secured in 2017. 26 countries are represented at the event. 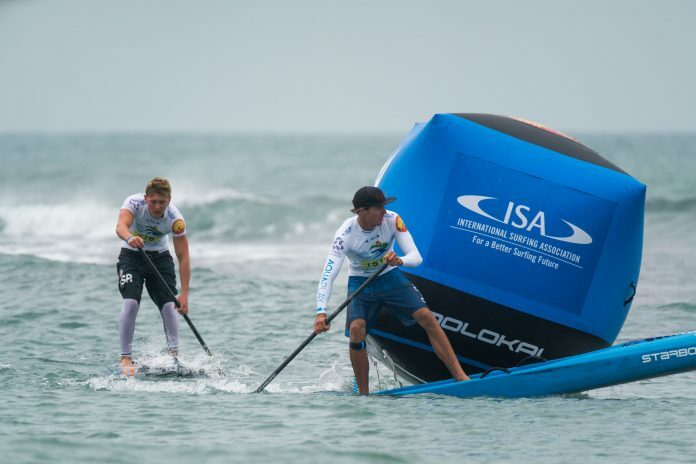 Please see below for the full team that are competing at the 2018 ISA World Stand Up Paddle and Paddleboard Championship being held at Riyue Bay, Hainan Island, China from the 24th November – 2nd December. For further information on the New Zealand Stand Up Paddle and Paddleboard Team please contact Surfing New Zealand’s Ben Kennings on 021 2278732 or email benkennings@surfingnz.co.nz. Follow Surfing New Zealand via Facebook, Instagram, Twitter and Snapchat – @surfingnz.